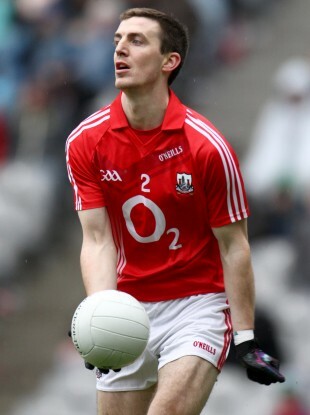 Cork defender Ray Carey in action during last April's league final against Mayo. CORK DEFENDER RAY Carey is expected to be fit for selection for Sunday week’s All-Ireland semi-final against Donegal despite being taken off with a hamstring injury during their quarter-final win over Kildare a fortnight ago. Carey was forced off in the 47th minute of that victory over the Lilywhites with Bishopstown clubman Jamie O’Sullivan coming on to replace him. Clyda Rovers defender Carey was then unable to line out for divisional outfit Avondhu in their Cork senior football championship fourth round win over Ilen Rovers last Saturday due to the injury. However Rebels manager Conor Counihan has revealed that Carey should be in contention for a place in the Cork rearguard for their last four battle with the Ulster champions on August 26th. Counihan admits he is more satisfied with his squad’s preparations in comparison to last year when they were coming off the back of their 2010 All-Ireland triumph. Yet he insists he would have preferred a tougher battle in their recent All-Ireland quarter-final against Kildare instead of the comfortable 2-19 to 0-12 success that Cork enjoyed. “The real test of hunger comes when things get really tight and to date this year that hasn’t happened. But when you come back from a holiday in the middle of January as we did last year, it’s hard to make up ground as the focus has shifted. So I think from that point of view we’d be in a better place this year. Afterwards last year with the benefit of hindsight, you say, yeah, this box wasn’t ticked or that box wasn’t ticked. Whereas now you’d like to think that you’re ticking most of the boxes. Email “Cork hopeful of Carey being fit for defence against Donegal”. Feedback on “Cork hopeful of Carey being fit for defence against Donegal”.